Just a couple months after the digital debut of X-Wing and TIE Fighter, the folks at Good Old Games have announced plans to start selling three more classic Star Wars titles: Star Wars: X-Wing vs. 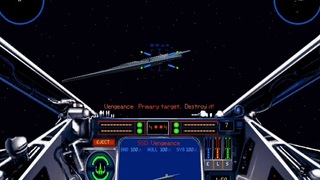 TIE Fighter, Star Wars: X-Wing Alliance, and Star Wars Galactic Battlegrounds Saga. As for the rest of LucasFilm's massive catalogue, well, we probably won't see (the original) Day of the Tentacle or Grim Fandango any time soon, given that Double Fine is remastering them both, but I imagine the trickle of new re-releases will continue throughout 2015. GOG is already teasing another set of announcements for Thursday morning—"We're not saying more right now, but we know the wait will be worth it for six great reasons." Maybe they've snagged the films? GOG does sell movies now. I'm just hoping for Zak McKracken.